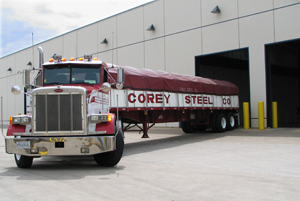 The mission of the Corey Steel Company Traffic Department is to ensure the delivery of material to our customers in an effective and timely manner and to be a desirable destination for common carriers. Regardless of how involved the Corey Traffic Department is in arranging delivery of our customers’ material, we are committed to ensuring our customers receive the highest level of service possible. The act of getting material delivered throughout the country is frequently rife with a variety of challenges. Corey’s Traffic Department celebrates the opportunities these challenges present to provide our customers with great service. We maintain our own private fleet of tractors and trailers. We staff our department with inspired and committed individuals who understand and share our customer service philosophy. We work closely with Sales, Production and other departments to ensure all customer requirements are completely satisfied. We work closely with common carriers to develop these valuable relationships and to ensure our customer delivery standards are clearly communicated and implemented. We work hard to ensure that common carriers who visit Corey have a positive and efficient experience. We know that the quicker carriers are able to leave Corey, the quicker our customers receive their material and the more likely that carrier will want to return to Corey.